National Bread Week is back for its fifth year from September 10 - 16, celebrating the island of Ireland’s great love affair with bread, from Soda to the ever-popular White Batch Loaf. In the accompanying video we meet the bread experts, featuring 3rd and 4th generation bakers, Brían and Barney Cully, from Cully's Craft Bakery, of Arva. During National Bread Week people will be asked what makes them a #BreadLover, whether it’s the evocative smell or the simple great taste. Bread is also so versatile and can be enjoyed every day and there is a recipe for all occasions. So we’re encouraging people to make the most of bread and try out some new recipes, from fruity Autumn Pudding to a hearty Full Irish Breakfast Frittata. The recipe below and many more are easy to follow and can be found at www.nationalbreadweek.ie/irish-bread/recipes. 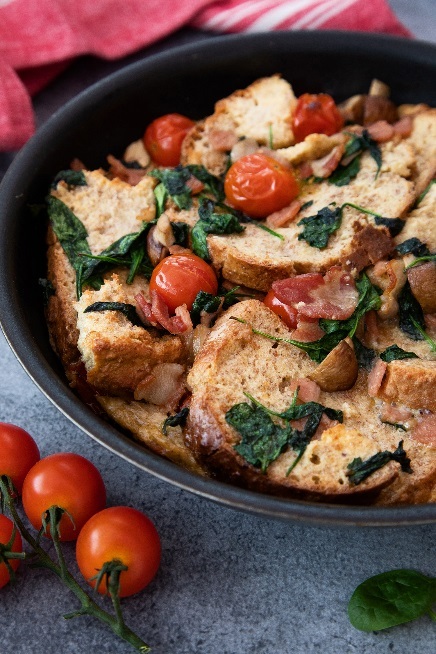 Heat the oil in a 23cm frying pan and fry the bacon and mushrooms for 3 minutes, add the tomatoes and spinach and cook for a further 2 minutes until spinach has just wilted. Meanwhile, mix together the eggs, milk and seasoning in a large bowl, dip in the bread and leave to soak while the bacon mixture is cooking. Pour the bread mixture into the pan and gently mix, then spread to the edge of the pan, cook on a gentle heat for 4-5 minutes until set on the bottom. Place the pan under a preheated grill for a further 3-4 minutes until golden and just set. Allow to cool slightly before removing from the pan. Cooks tip: Great to use up leftover cooked sausages, just slice and add to the egg mixture. For a vegetarian version, replace the bacon with extra mushrooms and tomatoes.